Signals of Spring is pleased to welcome Juno and Mickey, two Hooded Seals released on March 21, 2007 from Granite Point, in Biddeford Maine. Both seals are yearlings, (between 1-2 years old) rehabilitated at the Marine Animal Rehabilitation Center (MARC). Juno, a female, was brought to MARC in January with a broken jaw. Mickey, a male, was stranded on a Maine beach in January. Both seals were treated for injuries and infections and released a few months later. They each carry satellite transmitters that allow scientists to gather important information about their migration patterns and behavior. Data from Juno and Mickey's satellite transmitters is provided by Dr. Michael Williamson, professor at Wheelock College and founder of WhaleNet, Dr. Williamson started WhaleNet to provide scientists, educators, and students an opportunity to share data about marine mammals and further marine education. Today, WhaleNet is an award-winning site that recently received 125 million hits in one month! 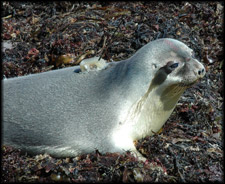 Hooded Seals are one of five species of seals for which WhaleNet provides satellite data. There is also data on species of whales, porpoises, and sea turtles. Over 110 different marine mammals have been tracked since WhaleNet began in 1992, allowing scientists to make important discoveries about their life cycles, habitats, migration patterns, and interaction with humans. Such important information allows scientists to make informed management recommendations that will hopefully lead to the protection of marine species. One species that may be benefiting from the excellent work of marine scientists and educators is the endangered Right Whale. The population of Right Whales reached dangerously low numbers after many years of hunting, collisions with large ships, and entanglement in fishing gear. In 1991, the National Marine Fisheries Service dedicated specific areas off the coast of North America, the Bay of Fundy, and Nova Scotia as critical habitat. Today, laws protect Right Whales from hunting and disturbance by boats. WhaleNet provides 11 years of data on Right Whales. Data is collected from satellite transmitters as well as from human sightings. Boaters, anglers, and researchers record the number and location of Right Whales moving along the Atlantic coast. Right Whale calving occurs in the waters off the coast of Georgia and northern Florida. Females have one calf at a time, between December and March, beginning when they are about 9 years old. Mothers and their calves migrate north to New England, the Bay of Fundy, and the coast of Nova Scotia where they spend their summer and feed on tiny, floating zooplankton. Right Whales are migrating north this spring, as they do every year. 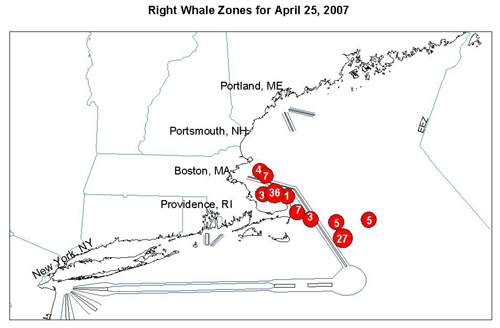 WhaleNet reports that just last week, on April 25th, over 90 Right Whales were sighted southeast of Boston, Massachusetts. The population that migrates along the east coast of the United States is called the western North Atlantic population. For many years, this population remained steady at 300 animals. This fall, numbers increased to 400 whales after a very successful calving season. Perhaps education and conservation have played some role in allowing the population to increase. In addition to data, WhaleNet includes lessons, activities, news articles, and movie clips pertaining to marine species. Dr. Williamson admits that while maintaining funding for his projects can be challenging, the marine education that results from shared data on WhaleNet is priceless, "I received an email from a student, who was a finalist in her science fair. She was thanking me because she created her whole project from WhaleNet data." Join this student and many others who have benefited from WhaleNet data. Check out how Juno and Mickey are doing by visiting the Signals marine 'maps and data' page.